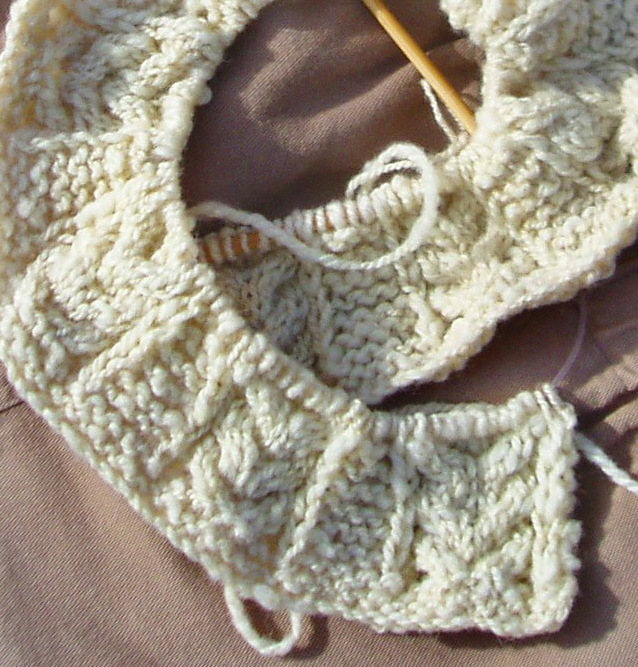 I’ve been weighing the pros and cons of making a cream colored fingertip length cape. Dramatic. But, here on the farm? Mmmm. I’d be daft, don’t you think? 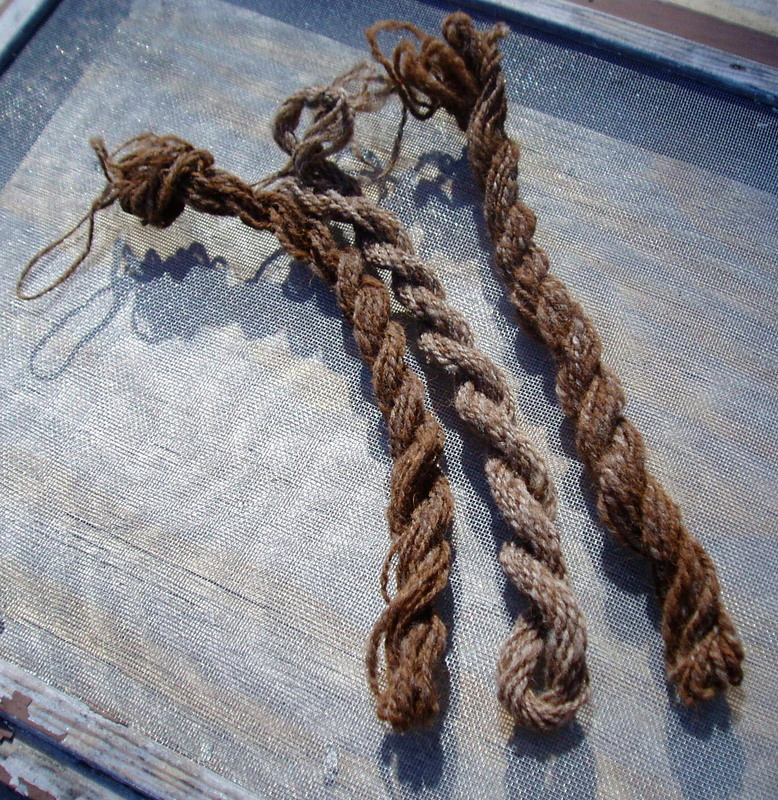 It’s just too off season for any natural dyeing. 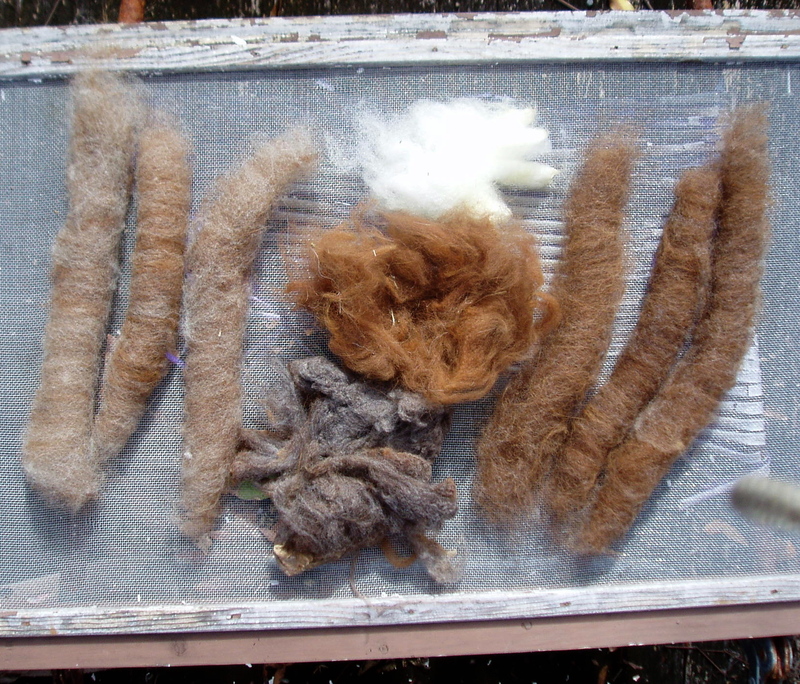 I don’t have a stash of coreopsis, or a trove of indigo…so…I looked into the guest room uh…fleece storage room. Seems I do have some color, indeed. I have, a couple of GCNI fleeces – these are grey fleeces from Running Moon Farm in Louisiana. I also have a russet colored alpaca blanket from a fellow named Lance who lives with my friends Martha and Randall in Georgia. And, let us not forget that silky long staple GCN from my friend Pat down the road. There you have the blends. With some adjusting, I think I could bring out the russet in the blend of all three. Though, those rolags of “just color” are pretty lovely. So far, though, the blend of 3 cards much easier, as the GCN is long and silky. All pretty. I am fonder of the darker yarns. But the greyish yarn is so soft. And, and this is a consideration, I would certainly be able to stretch “Lance” a lot further if he made up one-third of the 4500 yards. Okay. So that’s the predicament. Any help out there? I’m sitting on bags of fleece. A KAL came up that I could not resist. Meggie Ryan has designed a fingertip cape, Celtic in design, using her life, the Book of Kells, the Ogham alphabet, etc. How could I not want to own such a thing? Well, the requirements were posted. 4,500 yards of worsted weight, for one thing. Ahem. You non-knitters have any idea how much fleece it takes to spin that much yarn? I figure it’ll be about 5 pounds. 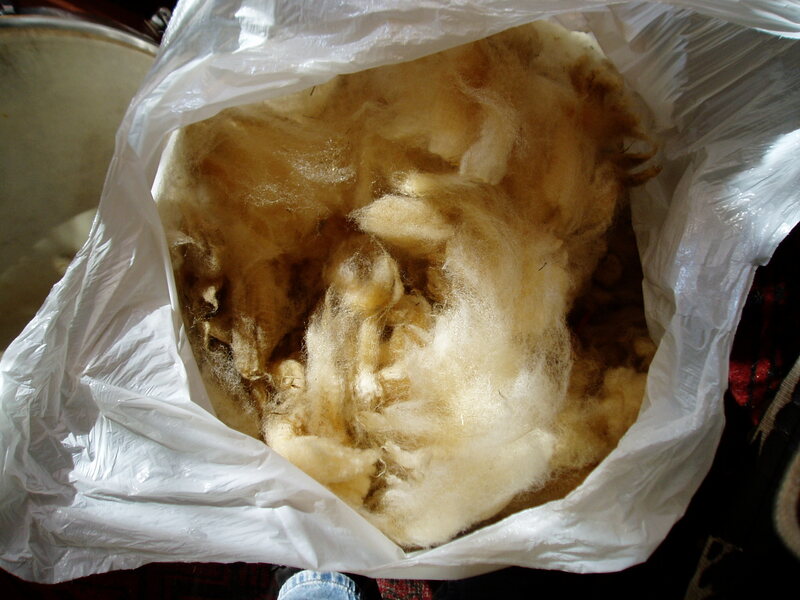 So, I looked at the bags of raw fleece in the studio. I have several that are over 6 pounds. So, I did what any red-blooded spinner would do, I sampled a bit of each. Wash wash card card. I chose “GCN 2010 #4” because she washes up amazingly white. Mindblower. Here’s the start of the covergirl of Knitting Green. 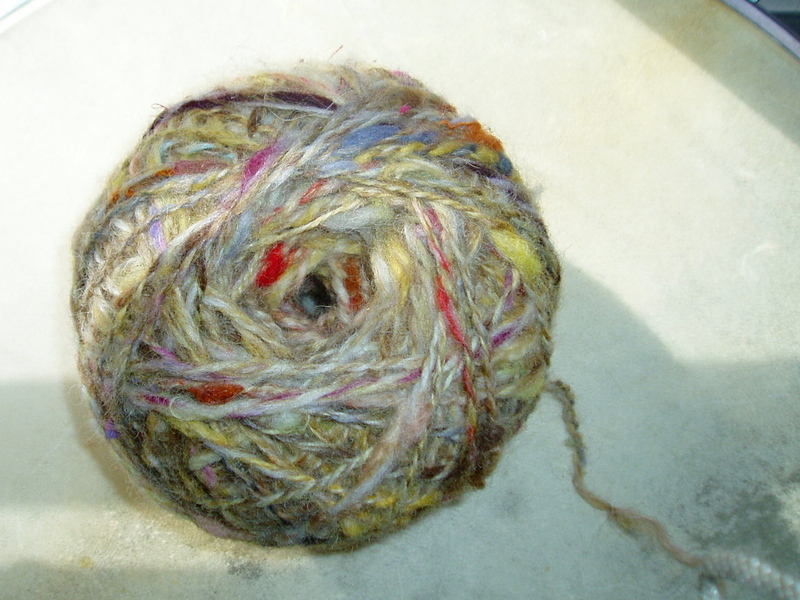 The yarn is Dove’s Roost Gulf Coast Native handspun. The sheep in question is Sally. 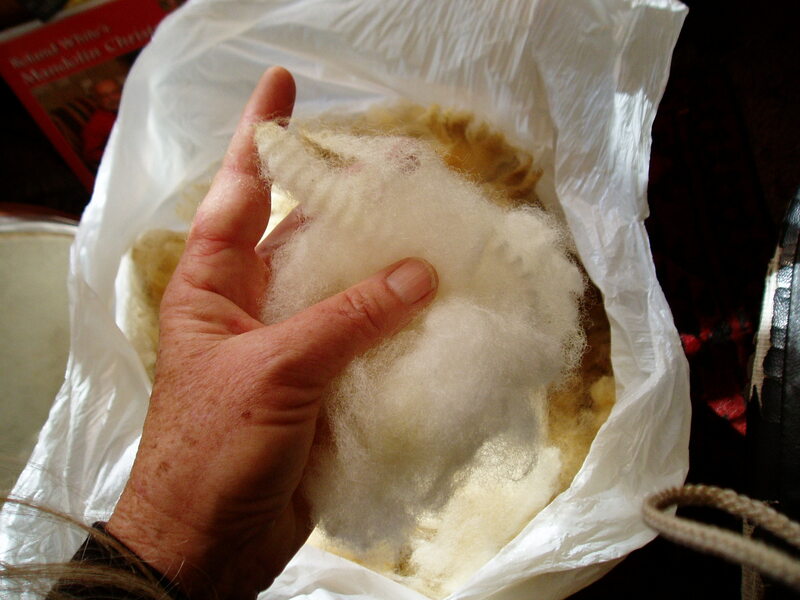 This was spun from her 2-yr old fleece (2nd shearing). Note to loose knitters everywhere: size 10 1/2 needles are called out in the pattern. 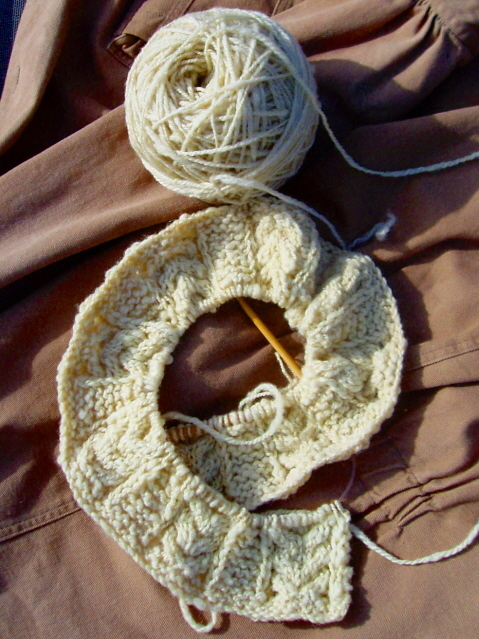 I’m knitting on 9’s and still not quite making gauge. At length they discover’d a bonie moor-hen. And O! as she wanton’d sae gay on the wing. His rays were outshone, and but mark’d where she lay. I’ve been wearing this little jacket out in the field this morning. The chickens and the sheep think I look A-OK. It’s also very warm and scrunchy, and my DH likes it very much! Cha! 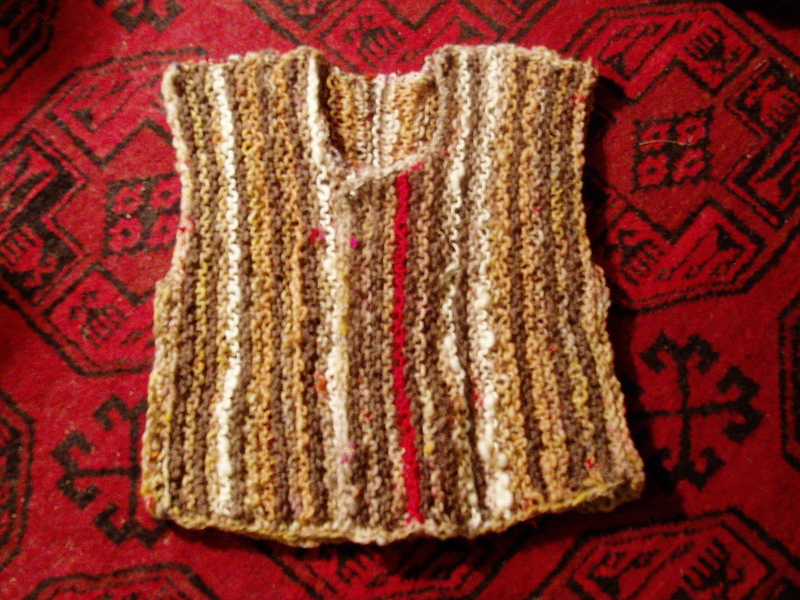 First handspun sweater of 2011, posted to 3 Ravelry Groups: 11 Sweaters in 2011, Crafting Poetry, and Knitting with Handspun. First project of the year. A little Farm Jacket. A little vesty thing. Cast on at midnight. 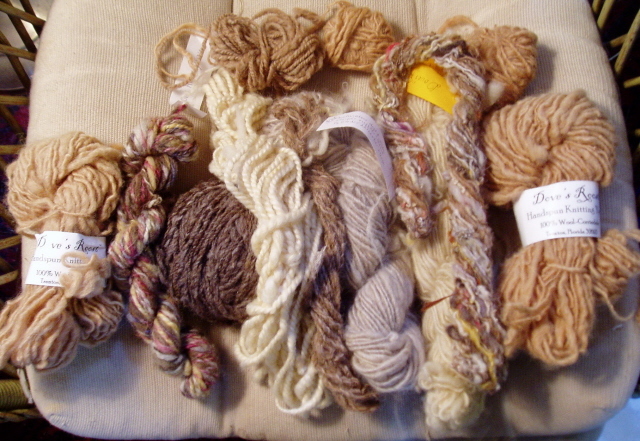 This yarn, A Sandy Field, is the one that’ll tie all those others together.